This year for the Christmas Cookie Exchange I’m bringing an exotic treat from the land of Canada called Nanaimo Bars! You ask, Na na what? Nanaimo is pronounced, Na ny mo. It’s a small city on Vancouver Island, not far from my hometown of Victoria. Nanaimo bars are actually common though out Canada, though there’s nothing common about them. Canadians love these no bake bars, which consists of a cocoa cookie bottom, a firm icing in the center, and a hard chocolate top. They are complex, sweet and chocolaty and when I go home to visit my family in Victoria I betcha that I eat Nanaimo bars every day! 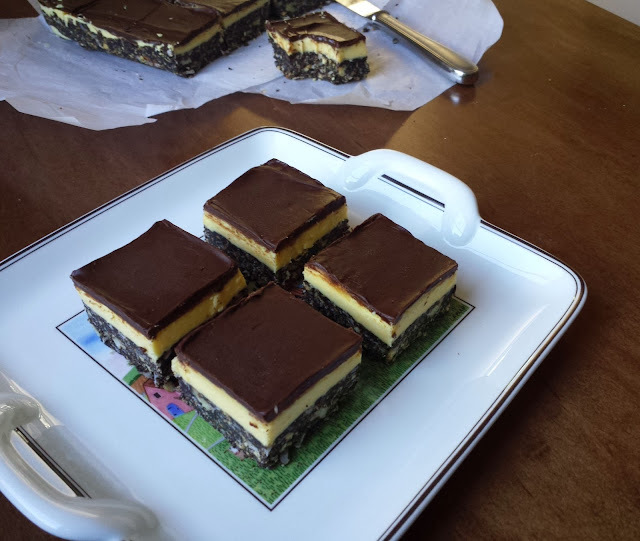 When I make Nanaimo bars for my American friends they go absolutely gaga; I have to admit that Billy and I are pretty selfish with these bars so we don’t share them often! I’ve tried to make my beloved Nanaimo bars a few different ways to find the ultimate Nanaimo bar, but the tried and true classic has ended up being my fave! I don’t know why I even tried to mess with it! Dark bitter-sweet chocolate is my favorite of all chocolates, so I do like to use Hershey’s Special Dark cocoa for the cookie layer, but if you prefer milk chocolate, stick to the regular cocoa or you may find it too bitter. 1. One must use custard powder which is a British product (easily found throughout Canada), if you’re grocery store doesn’t carry custard powder; you can purchase “Bird’s Custard Powder” on Amazon. I’ve seen some American recipes for Nanaimo bars that replace the custard powder with vanilla pudding, but it’s not the same at all! 2. Semi-sweet chocolate is best for the topping; it keeps the bars from becoming too sweet. So while I don’t like to share my Nanaimo Bars, in the Spirit of Christmas and giving, I’m going to try really hard to do just that this Christmas! You will need an 8 x 8 x 2 inch baking dish. Lining the pan with parchment or wax paper will make it so that the bars will lift out of the pan so that cutting is easier. Start by making the cookie layer. In a large bowl mix together graham wafer crumbs, coconut, pecans (or walnuts) and salt, and set that to the side. In the top of a double boiler melt together a stick of butter, granulated sugar and cocoa powder (I prefer dark cocoa powder because I love dark chocolate). Whisk occasionally until the sugar is completely dissolved. Remove the pan from the heat and quickly whisk in an egg and some vanilla extract. Pour the melted mixture into the crumb mixture and stir really well so that it's completely combined. Dump the crumb mixture into the baking dish and press down really firmly. I like to use a dry measure to press the crumbs even more, and to be sure that the layer is even. This is what the can of custard powder looks like. Please, please, don't try and substitute vanilla pudding, it's just not the same at all! My grocery store has an itty bitty British section, and that's where I find it; if your grocery store doesn't carry custard powder you can purchase it on Amazon. Whisk together the custard powder with some heavy cream; it will get quite thick, you just want to be sure that there aren't any clumps of powder. Add the custard to a bowl with some softened butter, confectioner's sugar, and a pinch of salt; whisk until completely combined and fluffy. I find it easiest to dollop the icing on to the cookie layer and use an offset spatula to spread it in an even layer. Set that to the side for 15 minutes to allow the icing to slightly harden, otherwise when the chocolate layer is added you will just have a melty mess. Now I am a great lover of bitter-sweet chocolate, and you may be a lover of milk chocolate, but in this case it's really best to use semi-sweet chocolate, or the Nanaimo Bars may be too sweet. Again, I like to dollop the melted chocolate over the icing. Then use an offset spatula to spread the chocolate evenly and put the bars into the refrigerator to set. Remove the Nanaimo Bars from the refrigerator after 50 minutes and score just the chocolate into 16 squares, don't cut through the bars yet; return to the refrigerator for at least 3 more hours, though overnight is best. Once the bars are set go ahead and cut them all the way through. I might have sneaked a couple of bites before I served these up, they're pretty hard to resist! 1. Add to a large bowl the graham crumbs, coconut, nuts and salt, stir well to combine. 2. In the top of a double boiler melt the butter, granulated sugar, and cocoa powder, stir occasionally until the sugar the sugar is completely dissolved. Remove the pan from the heat and quickly whisk in the egg and vanilla extract. 3. Pour the melted mixture into the bowl with the graham crumb mixture; stir well until completely combined. 4. Dump the cookie mixture into an 8 x 8 x 2 inch baking pan, press and pack it down firmly with fingers or the flat side of a dry measuring cup. Set to the side. 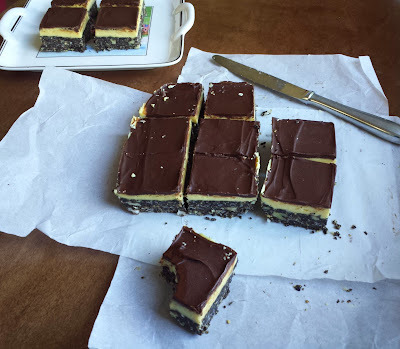 Note: To make cutting the Nanaimo Bars easier; line the baking pan with parchment or wax paper so that the bars can be lifted out of the pan completely for cutting. 5. In a small bowl whisk together the custard powder and cream until completely smooth (it will get thick; you just don't want any clumps of powder). 6. In a medium bowl add the softened butter, custard, confectioner’s sugar and salt; whisk until smooth. 7. Spoon the icing on to the prepared cookie layer and use an offset spatula or butter knife to spread the icing into an even layer. Set this to the side for about 15 minutes, so that the icing can harden just slightly. Note: Custard powder may be found in the international aisle of the grocery store, in the British section. The brand name that I’m familiar with is “Bird’s custard powder”, which can also be purchased on Amazon. 8. Melt the chocolate and butter in the top of a double boiler, whisking frequently until completely melted and smooth(be sure the water is only simmering, if it’s too hot the chocolate will seize). 9. Pour the melted chocolate over the icing layer and spread it into an even layer using an offset spatula or butter knife. 10. Refrigerate for 50 minutes, remove the bars from the fridge and score just the chocolate (being sure not to cut into the bars) into 16 equal sized portions. Return to the refrigerator for at least another 3 hours, preferably overnight. Nanaimo Bars are best stored in the refrigerator. Your bars look beautiful!! I wish these were more prevalent in the US :( They are soo good!! I remember when I first came across these a couple of years ago. You never forget that name! They look so so yummy!